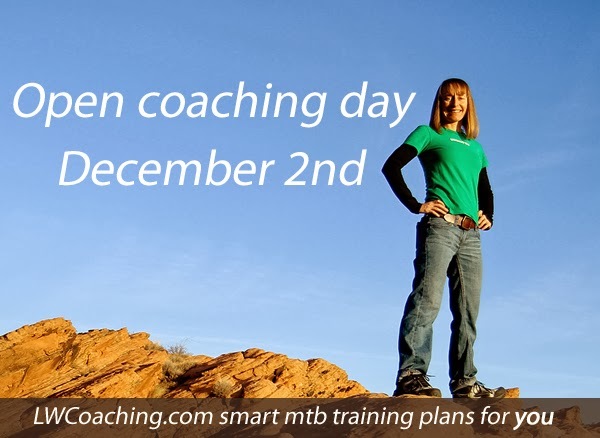 On November 1st I held an open MTB coaching day on my LWCoaching Facebook page. I hung out all day on Facebook, well except for a ride and a few errands ;-), chatting with athletes. We had 2,400 athletes “attend” during the day. It was a great event with a lot of action. Next LW Coaching Facebook Open Coaching Day is December 2nd. Need help planning out your season? Got a workout question? Come along and help make our December 2nd open coaching day bigger and better than the last one. Here are the Q & A’s from our Nov 1st FB open MTB coaching day. Mike Z: How can I train for altitude when I am stuck at sea level. All those trails at Crested Butte aren’t that great with a migraine and no legs. Coach Lynda: Being in CB with migraines – ouch. That sounds like torture. You have two factors to consider here; migraine triggers at altitude and pre-acclimatizing to altitude. Your migraine trigger in CB may be a variable you cannot change such as the altitude itself or may be a controllable factor. The prime controllable variable which may trigger migraines at altitude is hydration status. The air is thinner and holds less moisture at altitude, leading to faster dehydration than at sea level. Next controllable factor is brightness. You may need to wear a darker tinted lens at altitude. Different food maybe your migraine trigger. Pre-adapting to altitude while living at sea level is a challenge. Sleeping in an altitude tent, doing intermittent hypoxic exposure (IHE) and intermittent hypoxic training (IHT) work if you have access to an altitude generator. Riding at sea level in the heat daily for 10 days prior to travelling to altitude has been shown to increase blood volume and may assist with riding once at altitude. Take a rest week before you go to CB. Arrive in CB healthy and well rested. Once at altitude, maintain hydration status, take it easy for the first few days, wear a darker lens outdoors, maintain a normal diet and sleep 8+ hours per night. Aric H: Trying to move from sport to expert class xc and then transitioning to racing at Breck Epic and maybe one other stage race and then trying to get my speed back up for Cyclocross. All while running my own business and if it’s not too much trouble I would love to be ten pounds lighter. Coach Lynda: Aric, 10 pounds lighter right off the bat will set you up for your all your latter goals. I recommend you work on that first while you are building an aerobic base. This is a common situation for many athletes and I have a Weight Loss and Basr training plan designed exactly for this. This is a 12 week plan and goal on this plan is to lose 10-12lbs. Coach Lynda: ASAP is the best time to start the weight loss and base training program and get your body closer to race weight. Then do the TIME CRUNCHED Category 1 Cross Country MTB Build, Peak and Race Plan to build speed and finally do the mtb Stage Race training plan to peak for Breck Epic. Lisa R: From my past experience working with a coach, I’ve found that I tend to burn out after a few months if I have to be on the bike 5 or 6 days a week for training. Given perfect weather, ample ride partners, low workload and low family commitments, I can OCCASIONALLY get on the bike 5 days a week. Is it reasonable to expect to gain any fitness if I’m only on my bike 4 days a week? I’m all about quality over quantity. I have enough time now that two of those rides could be longish and I’m good with weight training, core work, running or cross training on the non-bike days. What are the best types of workouts to concentrate on? I just tend to lose motivation when I’m on the bike more than 4 days a week. -How to improve 45 min to 1:30 race pace (or one lap pace). My all day pace is pretty good and actually isn’t that far off from my one lap pace…what is the best type of workout to improve short distance speed on the MTB. -Fireroad or other non-technical, high speed downhills. I feel I’m a pretty good technical rider, can ride up or through lots of techy sections pretty well, but wimp out on the high speed downhills…typically the loose fireroads where you hit 25-30 mph or steep fast straightaways in the singletrack. I can slice and dice through trees but have a mental block and slow down once I seem to hit a certain speed. How do I fix this? I have struggled with this for years and it doesn’t seem to ever get better. How do I train my brain to think like a guy and just let ‘er rip? Coach Lynda: Lisa, so you are a slow twitcher eh? I would have guessed that. Slow twitchers have to work hard at the suprathreshold anaerobic stuff, the nueromuscular power and VO2max work. Cyclocross racing is great for this so keep on hammering away on that cx bike. Short power intervals with long rest periods such as 12 x 8-12 sec power sprints with 3 min recovery or 12 x 30 sec sprints with 4.5 min recovery are good sessions for you. It take patience to put in the long recoveries but that is what is needed to make the physiological adaptations work. I bet doing recoveries that long is tough for you! Coach Lynda: High speed fire roads – start by getting used to the speed on a paved road or in a situation that you feel safer with than a fire road. Get used to the sensation of the speed visually and viscerally then transition to a fire road situation. Riding fast on my moto dirt bike has helped get comfortable with the sensation of higher speeds but getting to that point with skills on a moto is a huge time commitment. It takes practice to get used to higher speeds and it takes practice to maintain this ability too. Lisa R: I have been doing “jumps” on my CX bike…all out, stand up sprint for 10-15 secs or 30ish revolutions, recover for 45 sec to a minute and do it again. 3 sets of 6 or 7 reps with 5 mins easy in between sets. Do I need to be recovering longer? I do have a hard time keeping the rpms up by mid way through the workout. Coach Lynda: That’s a good workout for cx racing. Keep that one in your revolution of workouts used. Add sessions with more rest and remain seated and focus more on muscular strength and core stability that standing and using gravity. Both sessions are good. Train multiple abilities, just not on the same day. Lisa R: Ok, last questions for now…I was looking at the Winter Plan for Endurance Distance and was wondering: The back to back long rides on the weekend don’t work for my schedule…could they be switched to a Wed/Sun or do they need to be back to back? I see that the recovery ride can be omitted – and I probably would skip it in lieu of family time, but could another one of those shorter bike workouts be omitted without too much issue? Its not just the mental drain of constantly being on the bike, but my body just doesn’t recover like it used to, so riding day after day after day – even easy – can be pretty draining. That was the other big issue when I was coached in the past…after three straight days of riding, sometimes I’d be way to blown to have a productive workout the next day. Coach Lynda: Lisa, endurance rides can be split up Wed/Sun if that is better for your schedule. For you I recommend omitting another short ride in lieu of more rest or a short run. If you have proven that riding 3 days in a row doesn’t work for you, trust that and modify the schedule to work best for you. Smart training plans for YOU! Lisa R: Thank you Lynda! Jason M: Moved from hilly PA to FLAT Michigan 3 years ago. With no climbing I’m finding it hard to match the strength, intensity and calorie burn of those rides without riding forever. Any suggestions to boost fitness and weight loss, whether it’s on the bike or in the gym? Especially during the coming winter months. Coach Lynda: Jason, If you are looking for pure calorie burn per minute it is all about how hard you are working. Intervals and heart rate zone 3 tempo rides are the biggest calorie burners. Running is a huge calorie burner too. Sit on your trainer or point your bike into a headwind in a big gear and peg your HR in zone 3 for 45 minutes non-stop. Hot yoga (Bikrams) is good to boost metabolism and nice when it is freezing out. Have a look at my Weight Loss and Base training program. Running, hot yoga and pedaling are all in this plan. Here is a free mtb weight loss and base training plan for ideas. Rich Dillen: Trash talk. Use it up on the start line or save it for the race? Coach Lynda: You have a limit on the supply? Rich Dillen: I have great material, good material, and stuff on the editing room floor. When do I pull out the big guns? Coach Lynda: The best time to use the big guns is definitely post race to leave all your opponents living with fjear for a whole week before the next race. Don’t get too hung up on actual race outcome. Rich Dillen: I never do. Trent C: Entering Breck Epic in 2014. How does one modify your endurance training plan to train for racing 6-7 days in a row? Better to focus on seat time and stick to endurance rides, or do some HIT training, and sacrifice some riding time? Fewer, longer rides, or more shorter rides? I am 47, so recovery time is becoming more of an issue than it used to be. Also, I am racing for a good placing, not just to finish. Thanks! Looking forward to working with you in the coming year! Coach Lynda: Trent, If you are racing for a good placing then you have to do the HIT work because the field at Breck Epic is fast! To race 6 back-2-back days fast you need to train and perfect your recovery techniques. Recovery nutrition, stretching, ice baths, compression legs etc – train with it, race with it. The endurance works needs done too so it is a balance. Coach Lynda: The best thing with running is not to get hurt and set yourself back. Cyclists typically have soft knees and a high cardiovascular fitness. This combo easily leads to overdoing it and developing running injuries. Start your running program very gradually and dial back at the first signs of injury. For mountain bike racers, running once per week, for 30 mins is a great addition to a general health program. Course should be flat or low grade hills. Walk rather than run down any steep hills encountered. Dirt, grass, trails, track and soft surfaces are preferable over asphalt. Avoid running on back-2-back days. Pace should be steady mostly aerobic heart rate zones 2-3. Running 2-3 times per week for 30 mins a session at mostly HR zones 2-3 is a good plan for the time crunched athlete. Jason A: Thank You, and great idea with the open Q & A today! Coach Lynda: Congrats on the Dr release! I bet you are ready to go! Start back gradually. Ride outside x 2 per week and do physical therapy and rehab specific gym sessions 2-3 x per week to start. When you are stable and provided your knee is 100%, add in the spin class. Ease into the spin class and gradually push up the intensity over several sessions as your knee allows. At all times knee health takes priority over speed of fitness development. Cyclocross racing is great training provided your knee is happy with it. Doing a longer ride outside one day per week and a cyclocross race is a good way to spend your 2 weekly ride days. Trish A: Thanks, Coach Lynda! Kim G: Hi Lynda, I’ve been racing sport class in a 6 hour endurance series this season (6 races). The last race is next weekend and I’m planning on beginning my race season in January with another likely 5-6 hour effort. I’m not sure how to approach a rest period. Do I need to take a few weeks off the bike? Coach Lynda: Kim, take 7 complete days off your bike after your last race, then follow it up with an easy just for fun riding week. Then, if you are mentally motivated and physically healthy, start training for next season. If you feel you need another couple of weeks of rest, take them. Downtime is as much for mental health as it is for physical. Kara C: If i had to take a season off of racing say due to something like pregnancy what should be my focus for the off season to be ready for next year? i was able to ride through the pregnancy just noot much intensity or anything. Coach Lynda: Kara, this is the perfect time to start right at the beginning and focus on base training and rehabbing your core muscles. If your rectus abdominis split you have to wait for that to heal before ramping up core work at all otherwise it can become a real problem. Plan your race season carefully this first year back. Hit shorter races for the first half of the season to get your fast back before you take on any endurance stuff. Right now work on building up with base training. Put in at least 12 quality base training weeks, then add in threshold work and short fast intervals. I don’t recommend racing until early spring. If you put in this base foundation now you will be strong. Big congrats on the new baby! You know that athletes come back stronger when they are moms right? 😉 Part of this is being time limited and forced to focus on quality training and ditch the quantity junk miles. Darren S: I plan to race the AZTR and just purchased your Arizona Trail Race 300 Training Plan. Love it! I don’t want to train on Sunday’s and wanted to know where I should adjust the schedule? My weekly schedule is pretty flexible so I can get the time in during the week as needed. Coach Lynda: Darren Awesome – AZTR is one of my all-time favorite events. To take Sunday’s off from training, move the entire plan back one day to pull Monday’s onto Sunday, Tuesday on to Monday etc. Then take the strength and stretching session from the original Monday (now moved to Sunday) and move it back to Monday. Basically double up a ride and strength/stretch on Monday and take Sunday off. Make sense? CPT: Its cx season and there are races every weekend, how often can you race without getting burned out or overreached being a masters racer? How many days off a week is good for a masters racer for cx or mtb? Coach Lynda: Christina You can race every weekend for about 3 weekends in a row then need a weekend off for a rest week and to rebuild some base fitness. For masters racing every weekend, Monday off the bike and Friday short recovery spin are standards. Tues is good for skills or base, Wed is a good threshold day, Thurs back to base and/or skills. Jamie Y: I want to lose some weight before next race season (10-15 pounds is probably the max i could lose) and gain base fitness. I like the weight loss and base training plan, but i can’t run bc i have neuromas in my feet (which is why i need to re-lose those 10 pounds to begin with!). Can you recommend another type of exercise that stimulates the metabolism and helps achieve the same level of weight loss? I have daily access to an olympic pool and have tried “water running” but i dont feel as if it is the same as road running. AND I am not a good swimmer. Thoughts? Coach Lynda: Do you have access to a Concept rowing ergometer? Does that irritate your feet? That is a big calorie burner and excellent for cyclists as it works the back of the body which is different from cycling. Jim F: Hi Lynda, I race for Pedal Pushers Cyclery as a masters 40+ Enduro racer. I don’t see an Enduro mtb training program from you so I was wondering which program would be best for me. Enduros require 4-7 stages with high output for 10 to 30 minutes, much different than longer xc or endurance races. How would my training be different? Coach Lynda: Jim, you are right I don’t have a pre-built mtb Enduro training plan yet. I recommend you follow the TIME CRUNCHED Category 1 Cross Country MTB Build, Peak and Race Plan. This plan has reduced focus on endurance training (the time consuming part) and increased focus on quality speed-work (what you need for Enduro). As it is a Time Crunched plan hopefully there will be room left in your schedule to do extra skills work and some lift served downhilling practice days. Jim F: Thanks Lynda! That sound like a good plan. I will get signed up for that asap. Follow up. Do I start that plan now, going into winter? Or should I do the Winter Mountain Bike Fitness Maintenance Training Plan and then theTIME CRUNCHED Category 1 Cross Country MTB Build, Peak and Race Plan as the race season and outdoor riding get closer in the spring? Coach Lynda: Jim I recommend doing the Winter Mountain Bike Fitness Maintenance Training Plan now and the TIME CRUNCHED Category 1 Cross Country MTB Build, Peak and Race Plan as the race season gets closer. Time the 12 week Build Peak and Race plan to end week #12 at your first race or your most important race. Bill W: After an extended break from riding/racing (18 months) what is the best way to regain competitive fitness in a fast and efficient manner? Available training time 10-12 hours. Coach Lynda: Bill start back with a base training program. If you need to improve your body composition do the Weight Loss and Base training plan. If you are close to your ideal weight, follow the Masters 40+ Cross Country Base Training Plan. Fort J: What series of plans would work best for an experienced endurance ss racer that wants to move from mid pack finishes to top ten finishes? Coach Lynda: Fort James what distance races? XC, endurance? Fort J: Hi Lynda. Endurance races. Our region is a mix of 4 hour or 50 miles events. Coach Lynda: I recommend following the single speed cross country plans. Start with the 12 week single-speed mtb Base training plan then move on to the single-speed mtb Build Peak and Race plan. Time the plans so week #12 of the Build Peak and Race plan falls on the week of your most important race. If all races are of equal importance then schedule the plans so they end at your first race and you hit that race on form.